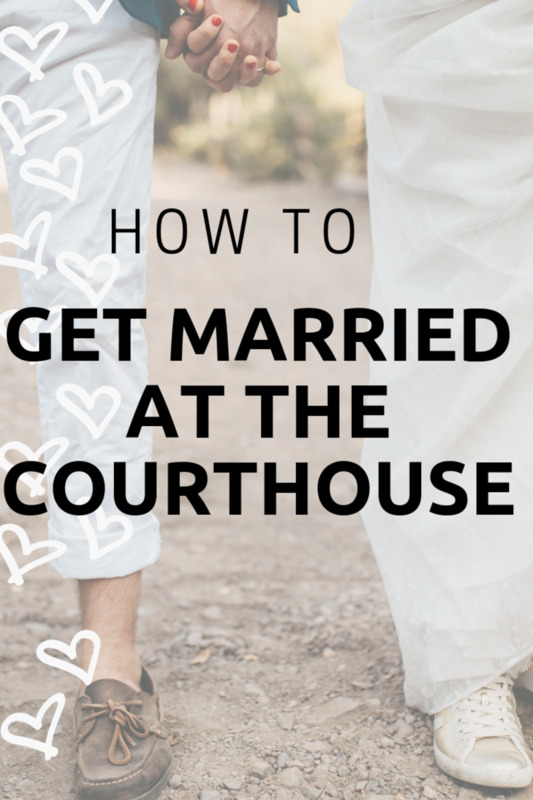 With the average cost of a wedding ringing in at over $27,000 - getting married on a limited budget can be extremely stressful. With the rise in prices of services, you need to be able to improvise and get creative for things like DIY wedding flowers and centerpieces. You can organize an entire wedding, without overspending or breaking the bank - here's some ideas to show you how! You can check out the full list of tutorials and instructions here DIY Wedding Decorations on a Budget. 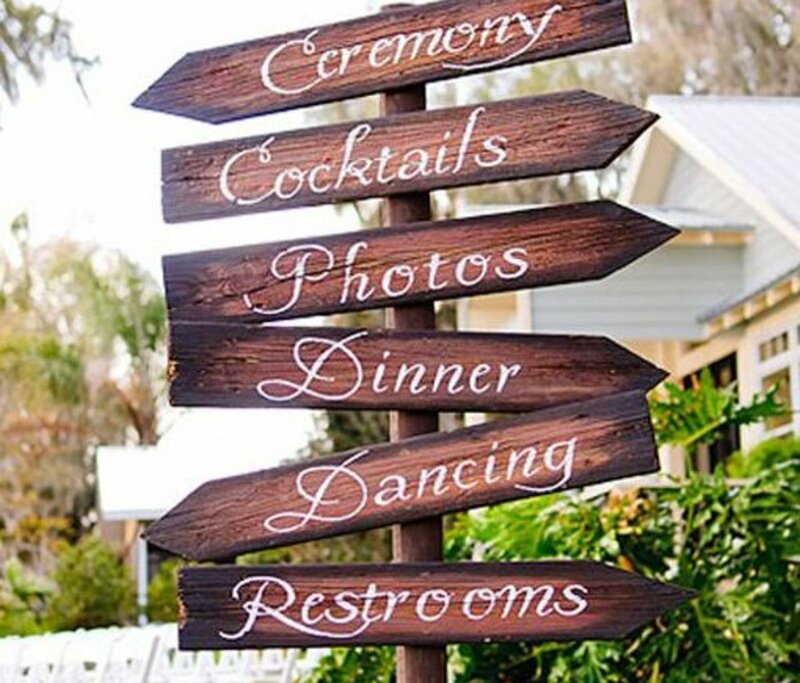 Ask guests to take their own pictures and send to you after the wedding or maybe it would be fun to ask two good friends to be your unofficial photographers. Depending on your camera, if you look online you can get deals for film to keep your costs right down. 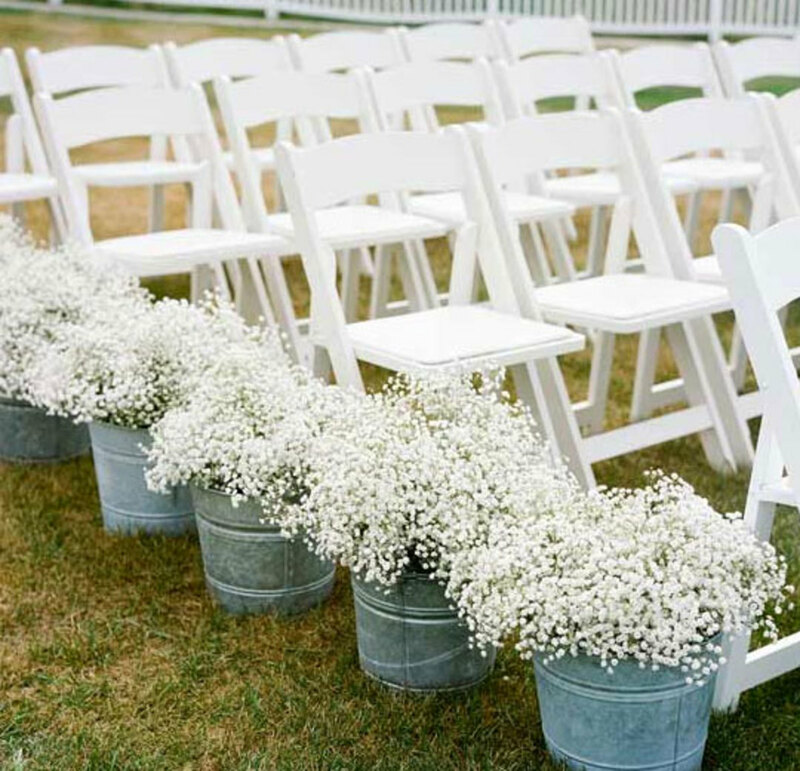 Look for some pails or buckets at the dollar store and just spray paint them silver or you could paint them in your wedding theme color. Adding flowers the colors of your seats will set a beautiful scene. Place them the end of seat rows to really make a statement. What could be prettier than burlap and coral? 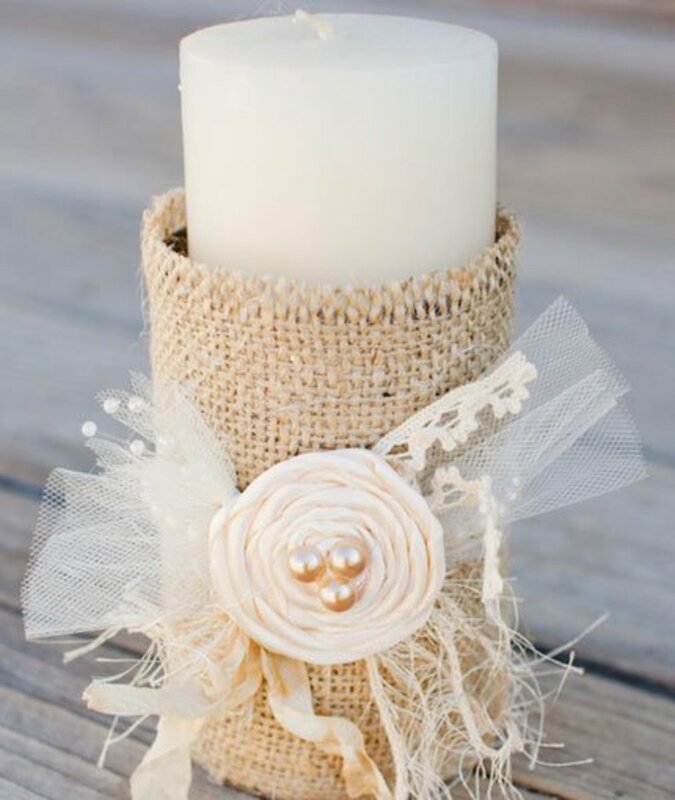 Plain candles look divine dressed up with burlap, and have the ribbon in the color of your wedding. 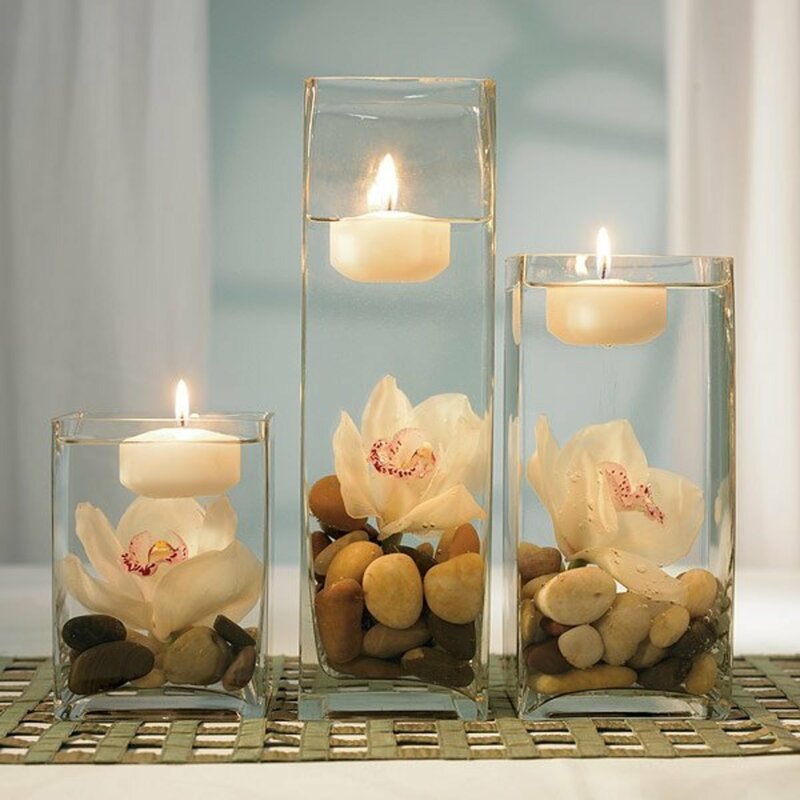 You could alternate the candles with vases or bottles wrapped in twine for an even stronger effect. 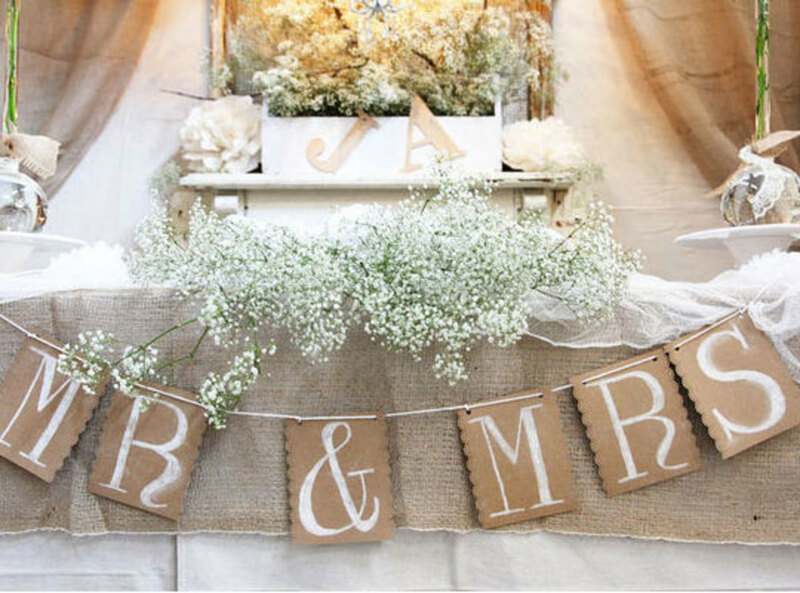 Welcome your guests with a DIY wedding sign. Try repurposing an old headboard or even a pallet. It will also be a great piece to hang up in your home after the wedding! 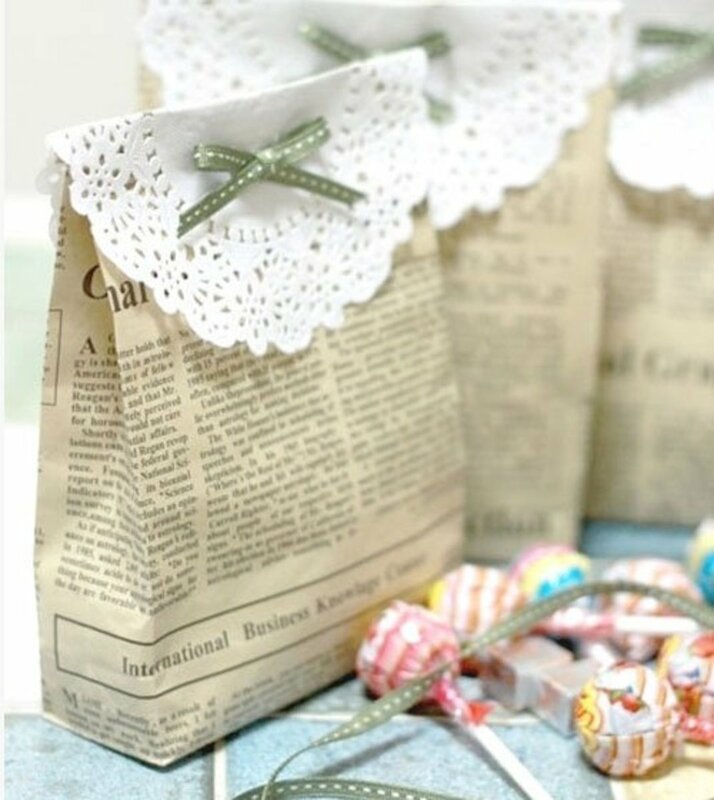 A homemade doilies gift bag made out of newspaper is perfect for the vintage wedding. Fill it with whatever you like for example carmel popcorn or candy. 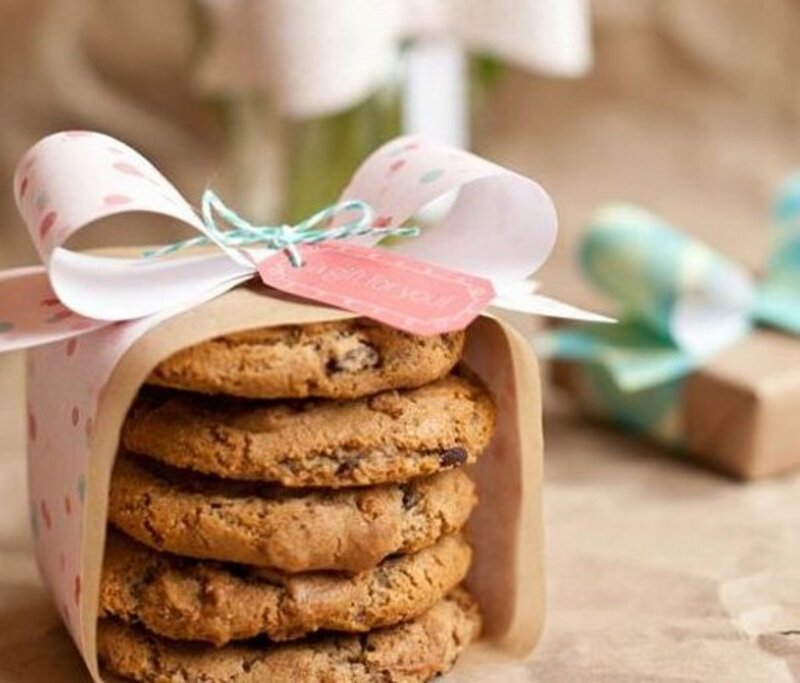 Why not have a bar of snacks with thank you bags and let the guest put together their own treats to take home. 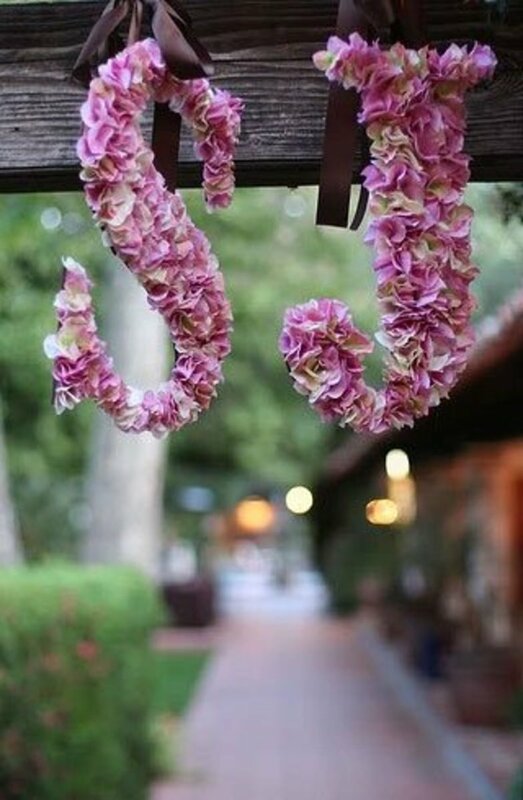 A monogrammed floral arrangement is beautiful on a church door, ceremony or at the reception. It's a cheap and easy way to utilize plastic flowers from the dollar store, in your own wedding colors,and the cardboard letters can be purchased at your local craft store. 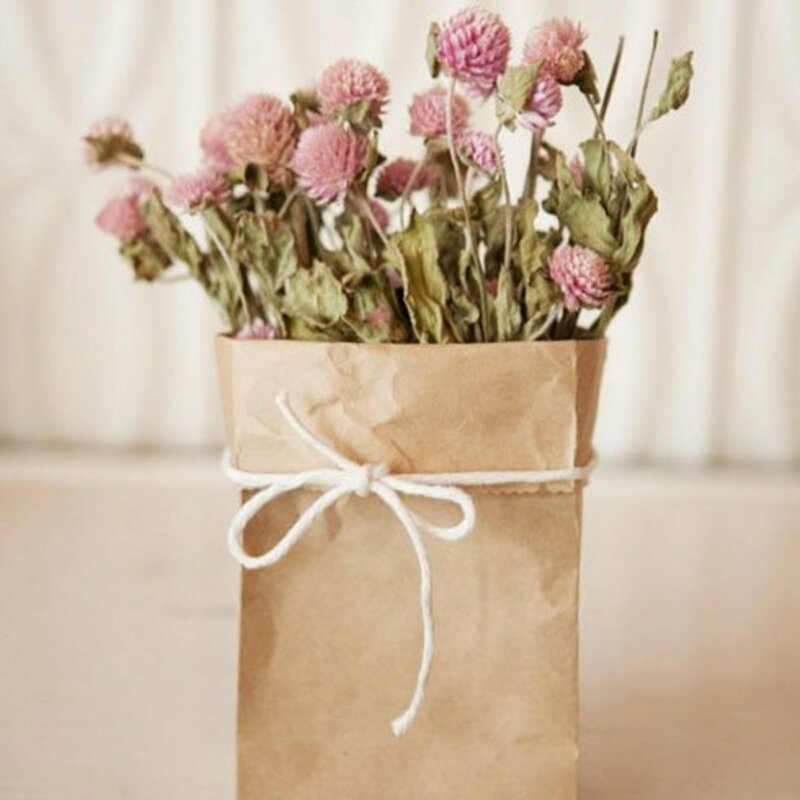 A simple paper bag tied with string and flowers inside looks clean and elegant as your wedding centerpiece or on each individual table. 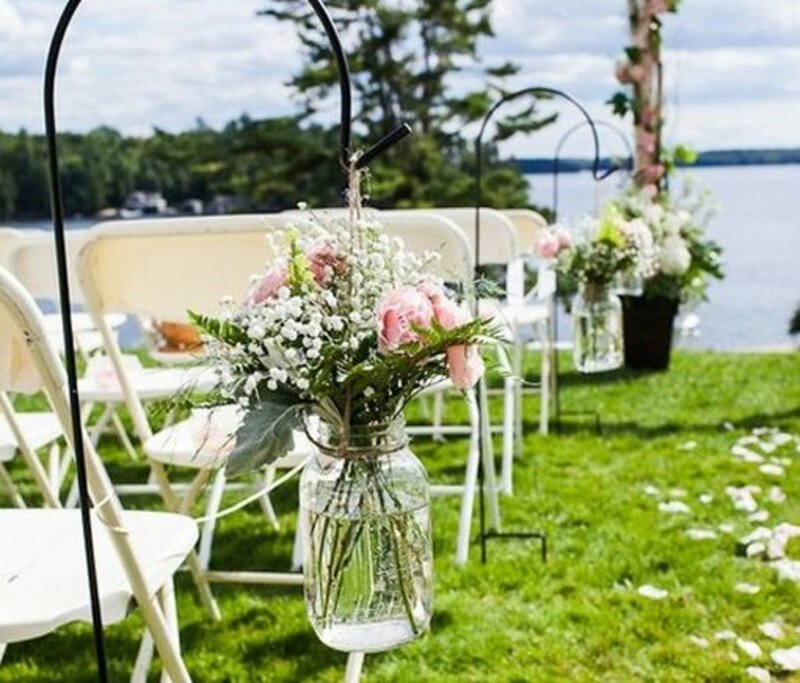 Upcycling mason jars and filling them with flowers as chair decorations looks really dainty and pretty. If you want to go a step further, you could stain the jars in the colors that you wish. 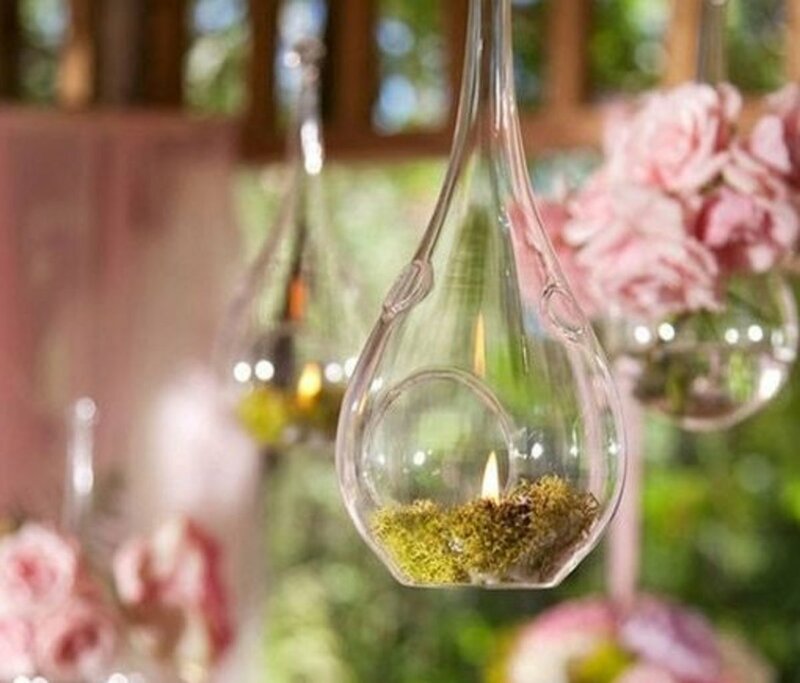 Hanging filled, clear baubles looks a little bit whimsical, and are an ideal alternative to the usual floral centerpieces. 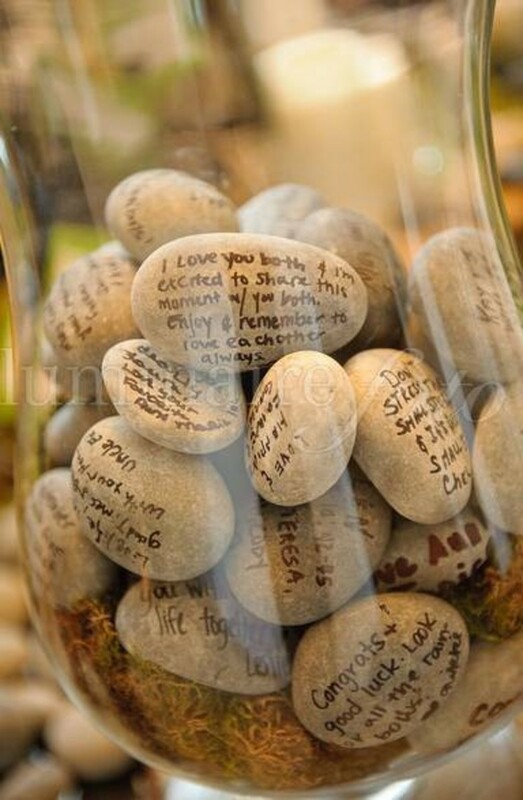 You can purchase them from craft stores and fill them with whatever suits your theme, for example little shells for a beach wedding. Remember to check the link at the top of the page for full instructions ! Tulle is just the perfect way to accessorize your wedding. It's cheap to buy and you can have a lot of fun with it. 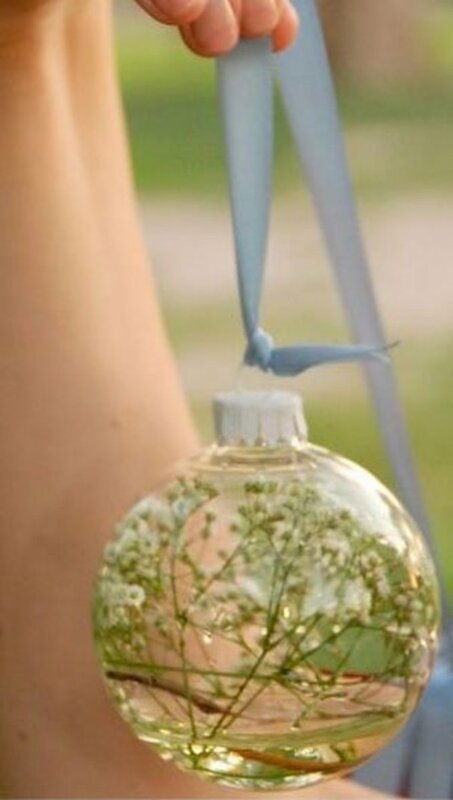 Try making it into bows and tying it around flowers and fairy lights for a fanciful look. 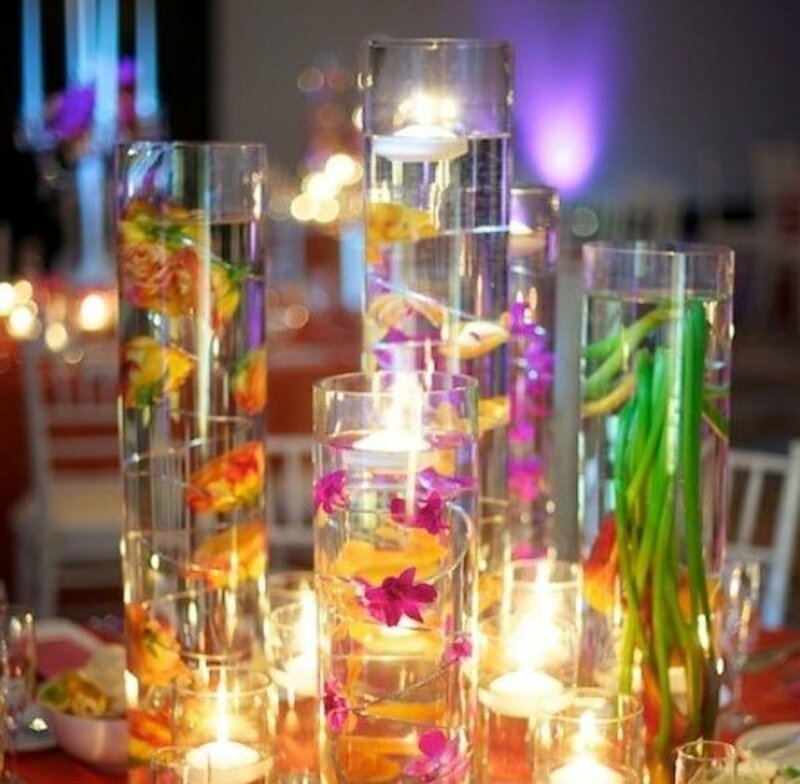 Using tall glasses or vases , twist a fresh or fake flower inside with water. The more color the better. Pop mini tea lights around this look to finish it off. A Perfect pairing is tea and handmade cookies. Use pretty gift wrap and seal with a sticker bearing the couple's initials. You could even pop them into cups from the dollar store, decorated with sharpie markers. Banners are really simple to make and there's a multitude of possibilities here from scraps of paper to swatches of fabric. You could place the banner on the dessert table or even at the head table, depending on what look you want. 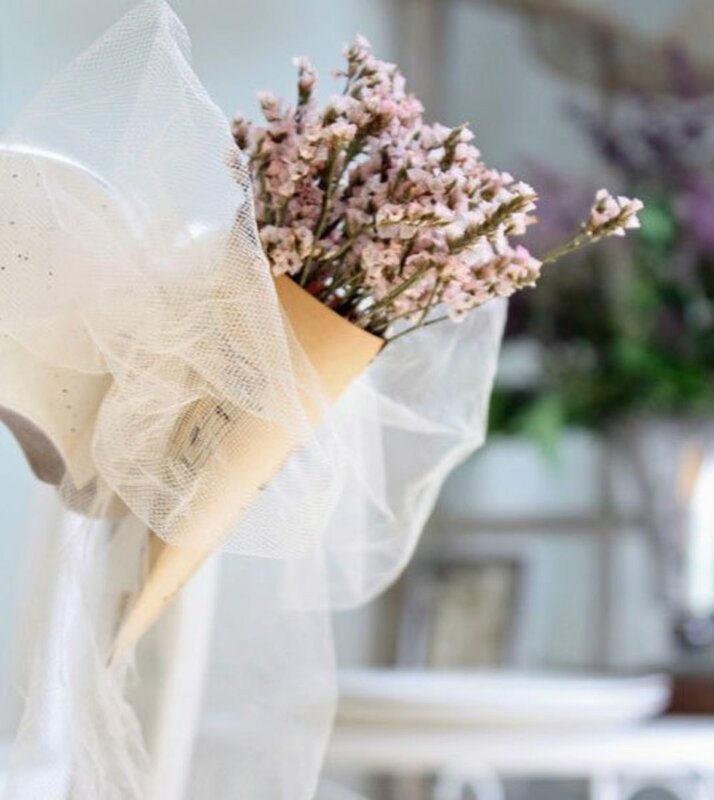 Instead of a cluster of smaller paper flowers, why not go with one or two statement flowers? 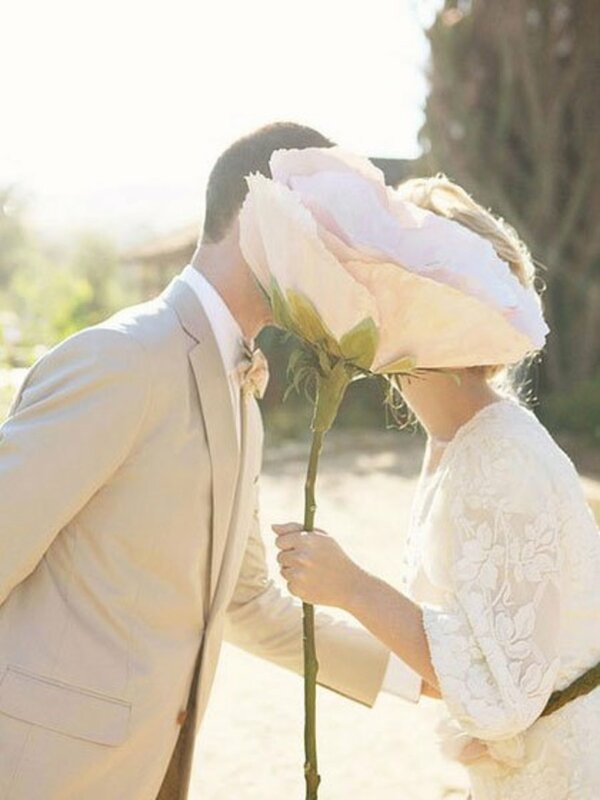 These over-sized paper flowers are great as photo props and add a fantastical quality to your day. Use materials you likely already have on hand: scrapbook paper, cardboard circles, scissors and double-sided tape. 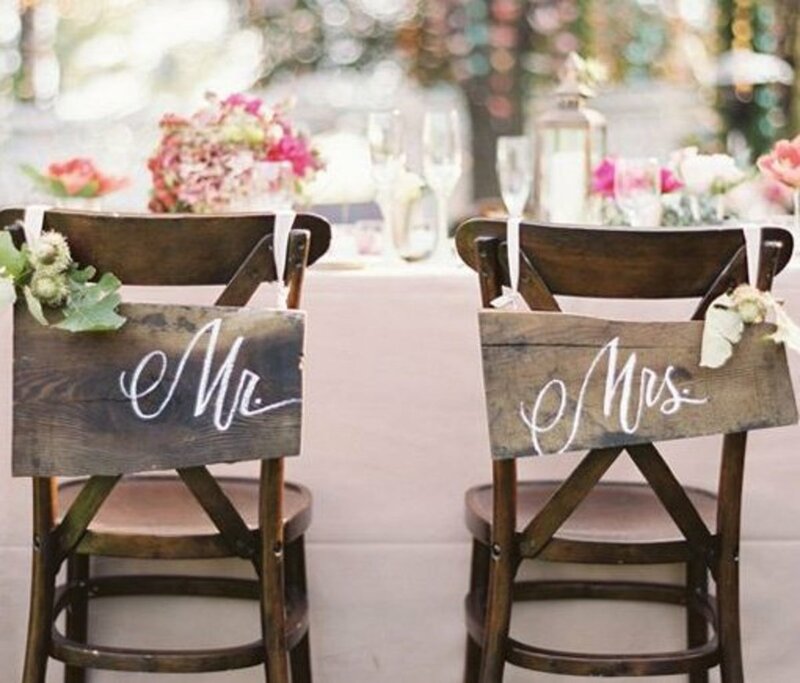 Go simple and rustic with ribbon and wooden signs for the bride and groom's chair backs. You could paint the wood in a shade that matches your bridesmaids dresses. Hanging decorations allows you to add levels of interest. This plays well for photographs and for lighting. Use fake tea lights instead to minimize risk of fire. You can use whatever bits of plant you like inside, from moss to faux grass. Confetti cones are a great idea for giving guests on your big day. 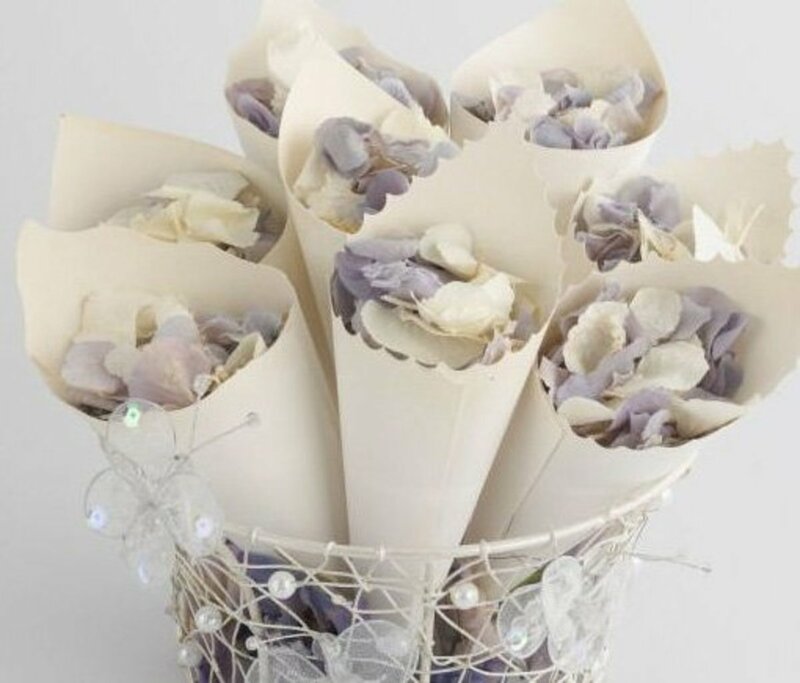 Use book pages or kraft paper to make flower cones for the send off. If you are putting flowers inside, get some floral water tubes to keep the flowers fresh. 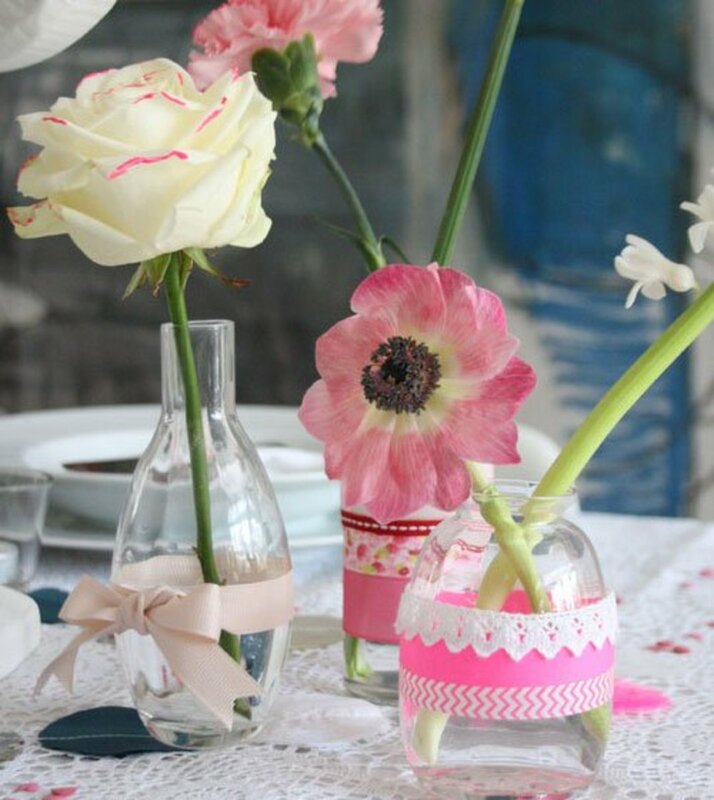 Add a pop of color with some scrapbook paper in bright colors wrapped around vases and matching ribbons. You could even use fancy wallpaper if you so choose. 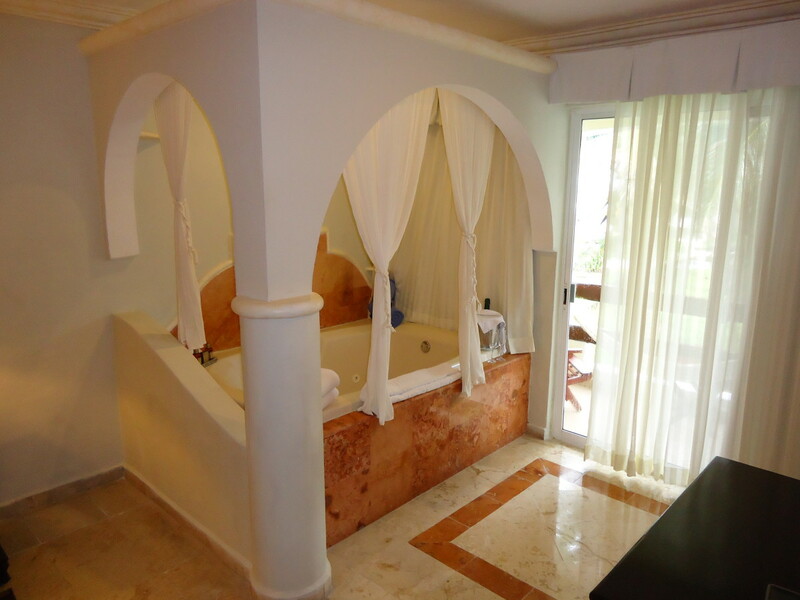 Check out the link provided for more great ideas! Thanks so much for visiting and sharing Au fait ! 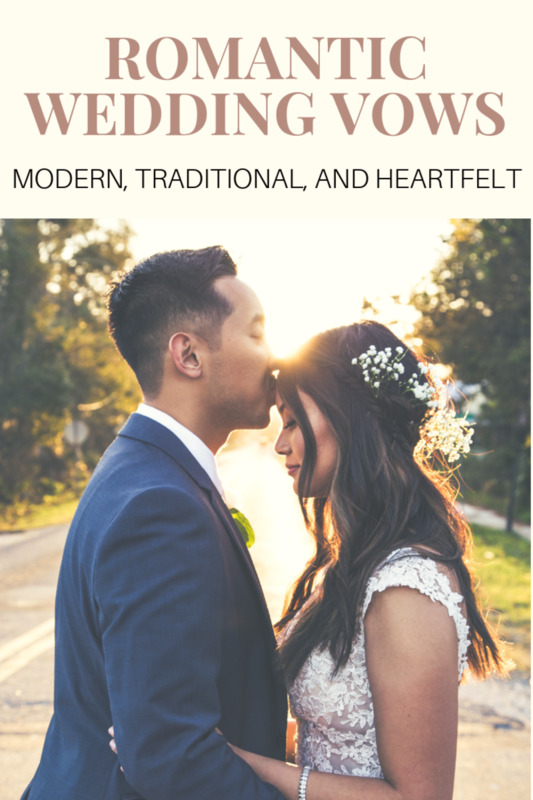 Thought I would give this great article a share since June, the wedding month, will soon be here. Voted up. Thanks for visiting Au fait, great ideas , and what a creative family you have. 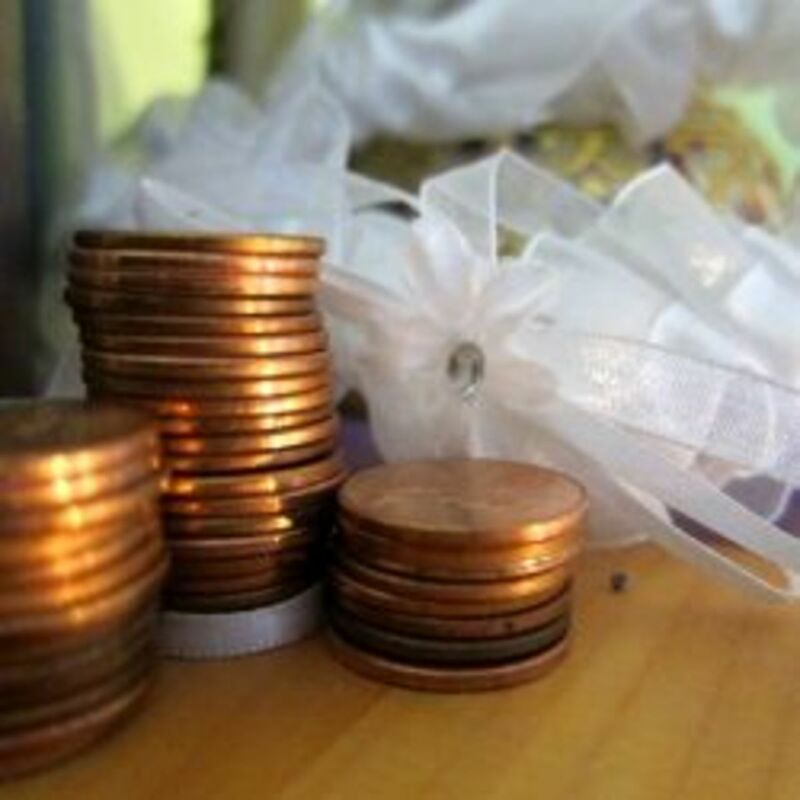 Yes it is a shame when people have to pay a lot of money for weddings, especially when there are so many ideas out there to be creative and frugal ! You might have to go to the antique shop for film and pay dearly because it's antique! Everything's digital nowadays and it's usually more convenient. 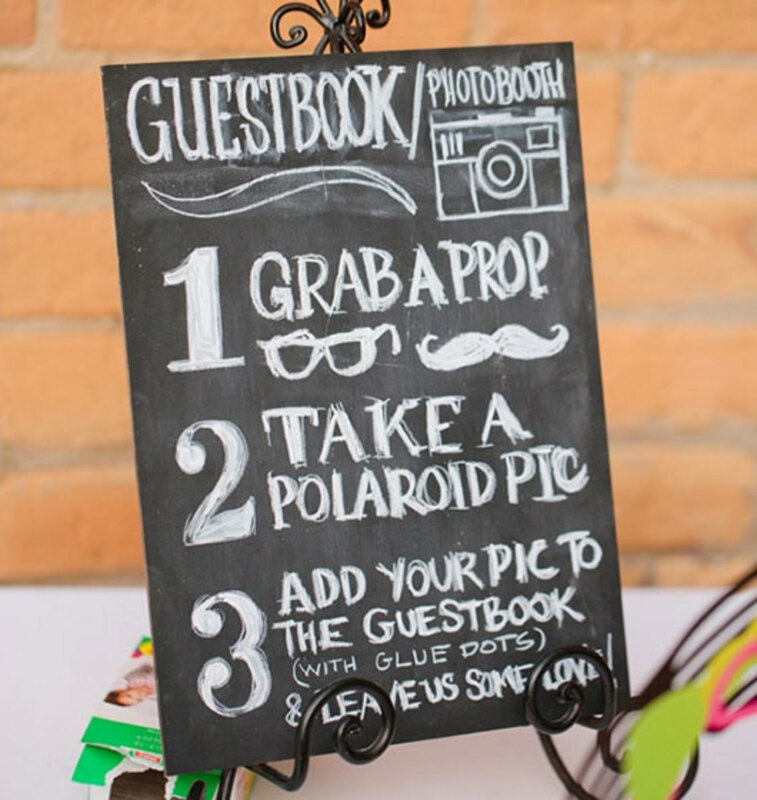 Set up a place online where guests can post/share photos from your wedding. Love these ideas you have. I think if I had to pay 27,000 to get married I wouldn't do it! That's a good down payment on an offspring's college education. But I think making one's own decorations, and doing as much of the other work involved in preparations, as possible etc., is very sensible. My sister made her own dress, the bridesmaid's dresses, the mother of the bride's dress, my dress, and my other sister made the bridesmaid's head pieces, etc. Flowers for church and table bouquets came from my mother's garden as did some of the vegetables at the dinner. One of my aunts along with my mother and sisters, cousins, and myself prepared veggies for salads. It was a large wedding and a lot of people pitched in to hold down the cost. My sister has made many wedding and prom dresses so it wasn't a big deal for her at the time. I have made prom dresses, too. They're not all that difficult and you can save 10s or hundreds of dollars if you can sew a simple seam. Voted up and useful and pinning to Awesome HubPages. I just got home from a wedding, so party favors are fresh on my mind. These are all great suggestions! Voted Up. Thanks Mary , wow you sound very creative , I also love working shells , they are beautiful ! One of my daughters got married a year ago, and was on a very limited budget. She loves the beach, so I made favors and table dec. from seashells, etc. This is a great Hub to help folks save money! Voted UP, and shared.